Small homes have become quite a norm nowadays due to soaring real estate prices and also problems in maintaining a big house. Having a cozy, small living room to return to after a hard day’s work is such a nice idea. You can experiment with the looks of the room more often and use items like silk flowers and plants to make the room look bright and cozy. A small living room needs special treatment. You cannot place heavy pieces of furniture nor use dark colors on the walls as that would make the room look smaller. Innovative use of lampshades, candles, flowers and mirrors can make a room look interesting and beautiful. While mirrors can create an illusion of space and make the room look large, the flowers can add brightness and warmth to it. Today, you don’t have to use real flowers and spend money by constantly replacing them. Fake flowers would fit your bill and style perfectly. Why choose fake flowers for a small living room? Real flowers look nice but need frequent replacement and care.Can you find time every morning to water the flowers? Fake flowers will save you a lot of effort and time. They are affordable and come in so many varieties that it becomes difficult to not buy several bunches. So, let’s see how you can use fake flowers in decorating a small living room. When choosing fake flowers, go for the ones that look real. You don’t want your room to look like a plastic factory. Moreover, do not display your entire collection together. Do not choose big plants for a small room no matter how tempting they look. Opt for smaller ones. Silk flowers like tulips, peonies, calla lilies and geranium will look good when arranged innovatively. You can use roses with peonies to create contrasting floral arrangements. Call lilies along with green foliage look good in a tall vase.Using different containers can be the key to creating a unique look for your living room. Apart from square or round vases, you can choose items like canisters or old coffee mugs to hold the flowers. Small flowers can be arranged in old saucers and placed on the window sill. Empty glass containers filled with pebbles and stones can also act as the base for your own fake flower arrangement. You can even hang the pots from the ceiling or the window and make the room look taller. Your computer table can have a tall vase with a single rose or lily to let your eyes rest on them when you feel tired. 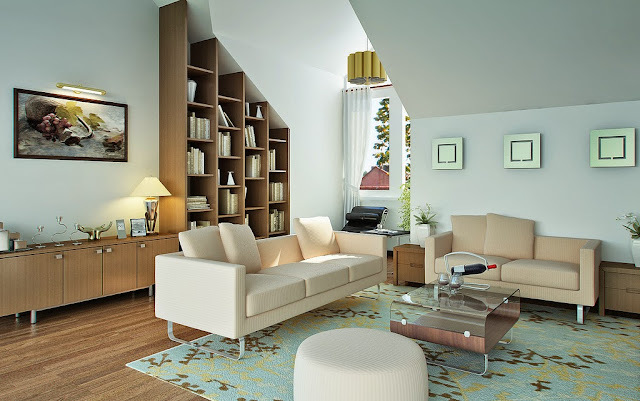 When it comes to ideas in decorating small living rooms, there is no end to creativity. You just need to experiment with different items till you find your own style. The best thing about a small room is you can always change the look in an instant. How Many Silk Plants Do You Put in a Room?